A foundation stick designed for portability and adjustable coverage that is easy to apply and blends all over the face or just where you need it to mask small imperfections, for that quick and easy on-the-go application! Build up your coverage as much as you require. Its creamy texture allows for a soft, smooth, velvety finish. The formula is enriched by White Clay which gives a cleansed and mattifying effect. 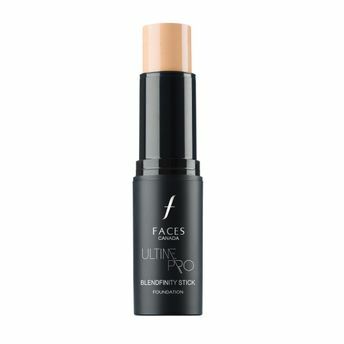 The FACES Ultime Pro Blend Finity Stick Foundation provides both, an optical blurring effect and a lifting/soft sculpting effect to the face. Its highly blendable formula provides medium to high coverage and the unique stick format makes it convenient to carry along and apply anywhere, anytime. Alternatively, you can also find many more products from the Faces Ultime Pro Blend Finity Stick Foundation range.